Phang Nga (Thai: พังงา, rtgs: Phangnga, [pʰāŋ.ŋāː]) is one of the southern provinces (changwat) of Thailand, on the shore of the Andaman Sea to the west and Phang Nga Bay to the south. Neighboring provinces are (from north, clockwise) Ranong, Surat Thani, and Krabi. To the south is the Phuket Province, connected by a highway bridge. The province is on the west side of the Malay Peninsula, and includes the many islands of the Phang Nga Bay. 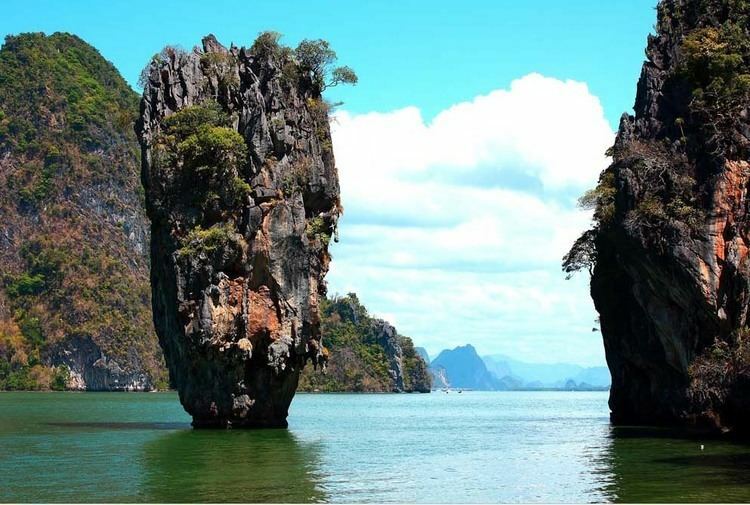 The most famous one is the so-called James Bond Island, a needle formed limestone rock in the sea, which featured in the 1974 movie The Man with the Golden Gun. 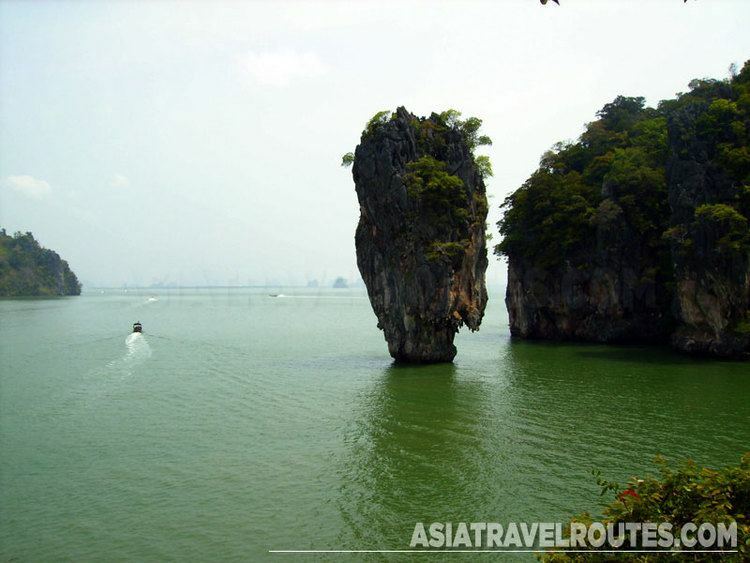 The Ao Phang Nga (Phang Nga Bay) National Park was established in 1981 to protect the many islands. The Similan Islands and Surin Islands, two of Thailand's main diving destinations, are also part of Phang Nga Province. 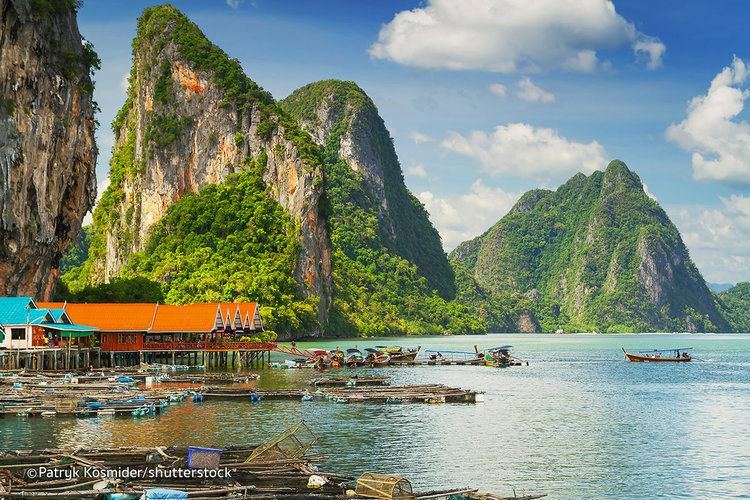 Phang Nga is the modern Thai transliteration of the archaic Malay word pangan, literally 'jungle'. The phrase 'orang pangan' denotes 'heathen, pagan, primitive people,' in reference to a generalised tribe or people typically inhabiting jungle areas of the Malay Peninsula and it's offshore islands. Historically, during the reign of King Rama II, nearby areas (including Thalang, now known as Phuket) were occupied by the Burmese and so many people fled to Kraphu Nga. 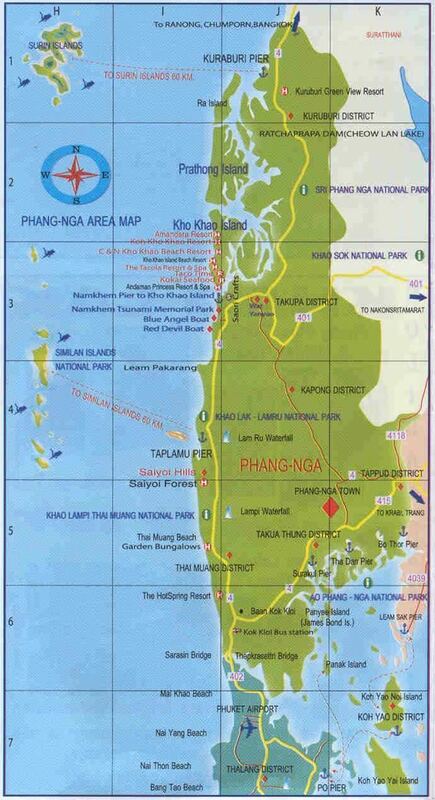 In 1824 when Siamese troops defeated the Burmese and the challengers were expelled, King Rama III renamed the major area adjacent to the bay phang-nga. This bastardisation of Malay pangan offers vivid indication that the entire region was likely populated by Orang Asli or other aboriginal people. In 1933 the town was promoted to provincial status. On the morning of 26 December 2004 the Andaman Sea coastline of the province was devastated by a tsunami and thousands lost their lives. The Khura Buri District, particularly Ko Phra Thong, has been called a "smuggler's paradise" and thus a key entry point into Thailand for human trafficking, Rohingya, Uighur, and Syrian refugees particularly. The provincial seal shows the Phu Khao Chang mountains in the background, with city hall in front. It also shows a dredge to represent the tin mining in the province. The provincial slogan is, "Massive mining industry, Ban Klang Nam "floating house", delightful caves, strangely shaped hills, Jampun flower, rich in resources". The provincial tree is the Cinnamomum porrectum (hardy cinnamon), and the provincial flower is Anaxagorea javanica. Phang Nga is subdivided into eight districts (amphoe), which are further subdivided into 48 communes (tambon) and 314 villages (muban). Hwy 4 is the main route that connects all districts in Phang Nga (except Kapong and Ko Yao). Hwy 401 connects Phang Nga to Surat Thani. Hwy 402 connects Phang Nga to Phuket Province. Hwy 4090 connects Muang to Kapong District. Railways: There is no rail system in Phang Nga Province. The nearest railway station is at Phunphin, Surat Thani Province. Bus: There are frequent buses to Bangkok and other provinces. There are also non air-conditioned intra-provincial buses. Public transit: songthaews are the most popular mode of public transportation in Phang Nga. Motorbike-taxi: These are found mainly in Phang Nga town and are used mainly for very short distances. Charges correspond to distance traveled. Airport: There is no airport in Phang Nga Province. The nearest airport is Phuket International Airport. Ao Phang Nga (Phang Nga Bay) National Park (อุทยานแห่งชาติอ่าวพังงา) was declared a national park in 1981. It has scenic views and features mass limestone formations scattered around in the sea near the shore. The same factors contribute to the density of caves in the area. The park is fertile with mangroves and there are a number of islands in the vicinity. Ko Panyi a Muslim fishing village on stilts. Mu Ko Similan National Park (อุทยานแห่งชาติหมู่เกาะสิมิลัน) was declared a national park in 1982. Similan is a group of nine islands. Off-season is 16 May–31 October. Mu Ko Surin National Park (อุทยานแห่งชาติหมู่เกาะสุรินทร์) is an archipelago of five islands: Ko Surin Nuea, Ko Surin Tai, Ko Ri, Ko Khai, and Ko Klang. It was declared a national park on 9 July 1981. The archipelago is in the Andaman Sea, near the Thai-Burmese oceanic border. There are coral reefs and the area is suitable for snorkeling. Ko Phra Thong (เกาะพระทอง), A large island northwest of Phang Nga. The island has many beaches. There is a large fresh water reservoir on the island. Khao Lak–Lam Ru National Park (อุทยานแห่งชาติเขาหลัก-ลำรู่) was declared a national park in August 1991. The park occupies an area of 150 square kilometers (58 sq mi) and covers Amphoe Thai Mueang, Amphoe Kapong, Amphoe Takua Pa, and Amphoe Mueang. The interesting attractions are: Khao Lak (เขาหลัก), which has the Chao Pho Khao Lak Shrine, Laem Pakarang (แหลมปะการัง) which has groves of pine, making it good for camping and relaxation, and Namtok Ton Chong Fa (น้ำตกโตนช่องฟ้า) or Ton Chong Fa Waterfall. Khao Lampi–Hat Thai Mueang National Park (อุทยานแห่งชาติเขาลำปี-หาดท้ายเหมือง) The park occupies an area of 18,000 acres (7,300 ha). It was declared a national park on 14 April 1988. Interesting attractions in the park include: Namtok Lampi (น้ำตกลำปี) is a 6-tiered waterfall that runs all year round; Namtok Ton Phrai (น้ำตกโตนไพร), a huge waterfall that runs all year round; and Hat Thai Mueang (หาดท้ายเหมือง), a long beach where the Sea Turtle Festival is held annually. Wat Suwannakhuha (วัดสุวรรณคูหา) It is of historical and archaeological importance. Within the boundary of the temple is a mountain with numerous caves out of which one is also used as a temple and houses various manners of Buddha images. There are also royal monogram inscriptions on the walls of the cave. Ko Yao (เกาะยาว) covers an area of 137 square kilometres (34,000 acres). The majority of the population are Muslim. The island is made up of two large islands, Ko Yao Noi and Ko Yao Yai. Hat Khao Lak (ชายทะเลเขาหลัก), 32 kilometres (20 mi) from Takua Pa, is a long beach along the Andaman Sea set beneath Khao Lak-Lam Ru National Park, parallel to the coast. Wat Rat Uppatham or Wat Bang Riang (วัดราษฎร์อุปถัมภ์ หรือ วัดบางเหรียง) A temple on Khao Lan hill containing several structures including an elaborate bell-shaped pagoda called Chedi Phutthathambanlue. The hilltop pagoda overlooks surrounding mountains and hills as well as a huge Buddha image and a Guan-yin Chinese Goddess statue. Kainui Mountain (เขาไข่นุ้ย) A mountain that has cool weather and is surrounded by the sea of mist all year round. In good weather, the Andaman Sea is visible from the summit. The majority of the population in rural areas is Muslim. Phang Nga however, does not suffer from any religious tension and the folk live in peace and harmony. Outside of the provincial town, the rural folk speak with a thick Southern dialect which is difficult for even other Thais to understand. On the small island of Ko Surin is a community of Sea Gypsies who still live their traditional life as seafaring people. These sea gypsies speak Yawi dialect. However, just like the long-necked Karen in Mae Hong Son, some folk complain that their village resembles a bit like a human zoo with hoards of tourists walking around gawking at the villagers. Watermelon Day (งานวันแตงโม) is organized every year. There is plenty of watermelon on offer and a food and beauty contest. Free The Turtles Fair (ประเพณีปล่อยเต่า) annually at Thai Muang Beach. The celebration takes place for seven days. During the festival baby turtles raised by the Fisheries Department are released into the sea at Thai Mueang Beach. Songkran Festival (งานประเพณีสงกรานต์) April merit making ceremonies, a water-pouring ceremony to pay respect to monks and elderly people, and many shows performed by local students. The worshiping ceremony of Narayana and his followers (งานบวงสรวงเทวรูปพระนารายณ์และบริวาร) There are also various shops, several forms of entertainment, and activities performed by students. Vegetarian Festival (ประเพณีถือศีลกินผัก) The Phang Nga Vegetarian Festival: Similar to the well-known vegetarian festival in Phuket and Trang, this festival is held from the first through the ninth nights of the ninth Chinese lunar month. Amazing Phang Nga Festival: High Season Opening in Phang Nga (งานเปิดโลกมหัศจรรย์แดนสวรรค์เมืองพังงา) There is an opening and special events ceremony in Khao Lak. The ceremony features entertainment, cultural shows, an exhibition of tourist attractions, water sports and local sport competitions, local products shops, and seafood from many resorts in Khao Lak.